I gave a presentation last Saturday in Richmond, Texas called "Drilling Deeper in the Lonestar State." The following case study of Frank E. Little is one the cases that I included in the "Drilling Deeper..." presentation. I have excluded most of the images from the case study report, but will provide you with a copy of the full research report if requested. Please contact me using the contact box in the right hand column of this blog. Ms. Judy Little Martin and Ms. Kathleen Baxter are interested in pursuing information about their shared Little Family history relating to the death of Frank E. Little. The following information is extracted from the first phase research report provided to Ms. Martin and Ms. Baxter. If you can provide more information on this case study, please contact me through the contact box on the right side of this blog post. 1. Find more information on the Frank E. Little who died in Rock Island, Colorado County, Texas on 6 September 1908.
a. What happened in Rock Island? b. Which ranch did he conduct and what does that mean? c. Essentially how did he die? 2. Evaluate each record to determine whether it is a match for Frank E. Little born 28 May 1855 in Crete, Will County, Illinois. 3. Prepare a narrative on the death of Frank E. Little. Frank E. Little was born 28 May 1855 in Crete, Will County, Illinois and is believed to have died in Rock Island, Colorado County, Texas on 6 September 1908. Ms. Baxter has provided a detailed timeline for Frank E. Little which shows him residing in Minnesota until 1875. He was in California in 1879 and Oregon in 1900. The following newspaper article led the search from Oregon to Texas: "Frank Little has sold his place in Shoestring and him and his family leave this week for Rock Island, Texas where he will conduct a ranch there." From the Roseburg Review, May 2 1908. We can see from the known birth date that there is a discrepancy with the birth date on the gravestone. However, the statement in the newspaper article does seem to suggest that Frank E. Little was residing in Rock Island, Texas from May to September of 1908 with his wife, Elizabeth Nightingale whom he had married on 24 November 1904 in Yoncalla, Douglas County, Oregon. In 1908 Frank and Elizabeth had one living child, Alfred Frank Little who was born 23 March 1907 in Yoncalla, Douglas, Oregon. According to the family tree of Judy Little Martin onAncestry.com: after the death of Frank E. Little in 1910 Elizabeth Nightingale Little is a widow living with her brother, Jacob Nightingale, and her son, Alfred Frank Little, on 25.24 acres owned by Jacob in Dallas, Polk County, Oregon and they are barely getting by. · When did Colorado County start collecting death records and sending them to the State of Texas? Did they collect records locally prior to complying with the requirement for State death registration? If so where are those records now? · A probate record might exist in Colorado County. · Colorado County may have voter registration records in their courthouse or in published sources. · Land records in Colorado County may list Frank Little in their grantee index. · The Family Search Wiki and Family Search Catalog should be reviewed for Colorado County to see what source materials are available. · Colorado County Tax Lists may not include Frank Little due to his brief time there. However if they do list a Frank Little in 1907 and prior, this may provide evidence discounting the match with Frank Little born in Illinois. · Historical context on the Oakes Family Cemetery in Rock Island should be obtained. o Who are the people buried there? o What do they share in common? o Was there a relationship between Frank Little and the people in the Rock Island community? · The catalog of the Clayton Library Center for Genealogical Research should be reviewed to see if any compiled source material is available on deaths in Colorado County. · Chronicling America will give us a list of newspapers available for Colorado County, Texas. · The Colorado County Library and other repositories may have newspapers on microfilm. · A complete review of the Colorado County library holdings should be performed to see what other sources might be available there. · A complete review of the Colorado County courthouse holdings should be performed to see what other sources might be available there. · The Galveston Daily News often included news from around the state. · Newspapers.com and GenealogyBank.com may have news of the death of Frank Little in Texas. · The Portal to Texas History should be reviewed for news of Frank Little in Texas newspapers. 5. The conclusion has been soundly reasoned and coherently written. The results that follow have been prepared within the guidelines of the genealogical proof standard. 1. When did Colorado County start collecting death records and sending them to the State of Texas? Did they collect records locally prior to complying with the requirement for State death registration? If so where are those records now? The Texas Death Certificate database at Ancestry.com was browsed to determine the earliest records for Colorado County. The earliest year available for Colorado County death certificates is 1902. Then there is a gap in the records until 1909. "Texas Deaths, 1890-1976," database with images, FamilySearch (https://familysearch.org/pal:/MM9.3.1/TH-1942-25178-81231-47?cc=1983324 : 22 July 2014), Death certificates > 1903-1909 > Vol 026-034, certificates 011385-015400, Carson-DeWitt counties > image 2133 of 3307; State Registrar Office, Austin. This confirms that the first death record submitted to the State of Texas from Colorado County was for a death that occurred on 11 Dec 1909. Browsing continued through the rest of the records for Colorado County from 1909. The last image for Colorado County was Image #2138 so there were only six death records submitted for the entire year of 1909 in Colorado County. Notes on the content of the film state the following: Microfilm of originals in the Colorado County courthouse in Columbus, Texas. Includes general index with some volumes individually indexed. However, even though the records show that they began in 1903 does not mean that they are inclusive of deaths in 1908. These two microfilms could be ordered from FamilySearch.org at an estimated cost of $15. The time to search the microfilm would be billed at $25 per hour. These microfilm or the original records might be available for inspection in Columbus at the courthouse or the library. Applications without the sworn statement and photo ID will not be processed. However, I always recommend that you call a county office before requesting a record search and paying a fee. In this case a call to the County Clerk revealed that I would need to come in to search for the record myself as they do not do searches for the death records from 1908. 2. A probate record might exist in Colorado County. · 1800 – 1990 Texas Probate Records 1800-1990 at FamilySearch — The procedure is to browse through each group of records. Probate Minutes for 1907-1910 volume Q was one of the scanned books available. There are 324 images in this record set. The front and the back of the volume were searched for an internal index but none was found. Given a death date of September 6, 1908, probate would have to be filed after that date. Image 125 of 324 shows items filed on August 22, 1908 and September 29, 1908. Image 128 of 324 shows that on the 12th day of October 1908 the County Court held a regular term. The search was suspended at page 135 of 324. This search can be resumed in a future phase of research. Ancestry.com. Texas, Wills and Probate Records, 1833-1974 [database on-line]. Nothing significant was found in this database. It seemed mostly to refer back to other databases already searched. 3. Colorado County may have voter registration records in their courthouse or in published sources. These records were not available on the library website or the USGenWeb site. This would require a courthouse site visit to Columbus, Texas to pursue this further. This would have to be completed in a future phase of research. 4. Land records in Colorado County may list Frank Little in their grantee index. This would require a courthouse site visit to Columbus, Texas and would have to be completed in a future phase of research. Also see the note below concerning microfilm at the Clayton Library. 5. The Family Search Wiki and Family Search Catalog should be reviewed for Colorado County to see what source materials are available. 6. Colorado County Tax Lists may not include Frank Little due to his brief time there. However if they do list a Frank Little in 1907 and prior, this may provide evidence discounting the match with Frank Little born in Illinois. The latest tax record available online is 1895. The Family History Library catalog shows microfilm available but the latest microfilm available is for the year 1901. Colorado County Sesquicentennial Commemorative Book (La Grange, Texas: Hengst Printing, 1986). F. B. Largent, Jr.
8. Historical context on the Oakes Family Cemetery in Rock Island should be obtained. o Comments: The cemetery contains one footstone with the initials "L. S. T." for which no headstone could be found. There are informal markers for at least five more graves. 9. Who are the people buried there? J. C. Oakes, a pioneer of the early days in Texas, died at his home north of Rock Island last Wednesday night at 9:20 o'clock. Mr. Oakes was 83 years old the 8 day of last September and had lived continuously at his home since 1852. He was married to Miss Melissa Cooper at Columbus and lived in the town of Columbus for two or three years, thence moving to his country home. His wife preceded him to the better world years ago. He was the father of 10 children of whom 8 are living. Mrs. D. A. Calb, of Sealy, Mrs. Ella Peters of Wharton, Mrs. Janie Besch of El Campo, Mrs. Ida Bennett of San Antonio, Mrs. Callie Cooper and Mrs. Bettie Green, who reside north of Rock Island and Messrs. D. E. Oakes of this place and W. I. Oakes of Near Rock Island. Mr. Oakes was born in West Virginia, but came to Texas in an early day and for a long time hauled freight between Houston and San Antonio. His remains were laid to rest in the family cemetery on the Crasco last Thursday, by the side of his wife, a large concourse of sorrowing relatives and friends being in attendance. Extreme old age was the cause of his death. Mr. Oakes was a fine old gentleman who had the friendship of everybody and will be missed. Thus the old land marks are passing away. We extend our sympathy to the bereaved ones. It is notable that John Calvin Oakes was the last date for marked graves in Oakes Family Cemetery. The following images show the land owned by John C. Oakes in 1895 starting on line 19. Line 19 shows that J.C. Oakes was an Original Grantee in Colorado County in Abstract No. 422 on the J.C. Oakes Survey for 160 acres valued at $800 in 1895. His total land area assessed in 1895 was 815 acres. 10. What do they share in common? The people buried in this cemetery appear to all be related to John Calvin Oakes 1828-1911. 11. Was there a relationship between Frank Little and the people in the Rock Island community? J.C. Oakes may have employed Frank Little to operate his ranch. In 1908, Mr. J.C. Oakes would have been 80 years old and may have needed someone to operate his ranch. However, he did have eight children alive in 1908. Three of the children of John Calvin Oakes resided near Rock Island. One approach to answering the question of relationship between Frank Little and the Oakes family would be to track down the descendants of Mr. J.C. Oakes. Another approach would be to track down the current property owner for the Oakes ranch. The following map shows the location of abstract #422 on the J.C. Oakes survey. The current property address is on County Road 106, Columbus, Texas. 12. The catalog of the Clayton Library Center for Genealogical Research should be reviewed to see if any compiled source material is available on deaths in Colorado County. Since all of these sources are reference material a trip would need to be scheduled to the Clayton Library to inspect them in person. Pub. Date: Myrtle Cemetery Association, 2006. This source might have more historical background about the Rock Island community. · Title: Colorado County Index to deeds 1836-1928 [microform]. Author(s): Texas State Library. Archives Division. This source might show land purchased by Frank E. Little. This source may help to locate a probate record as discussed in Item #2. 13. Chronicling America will give us a list of newspapers available for Colorado County, Texas. 1. Eagle Lake advertiser. (Eagle Lake, Tex.) 1893-19?? 4. Headlight. (Eagle Lake, Tex.) 1894-18?? 7. The Columbus weekly times. (Columbus, Tex.) 1867-18?? 10. The Columbus times. (Columbus, Tex.) 1867-???? 12. Garwood express. (Garwood, Tex.) 19??-???? 13. The Eagle Lake canoe. (Eagle Lake, Tex.) 18??-???? 14. The daily tribune. (Weimar, Tex.) 1898-???? 15. The Eagle Lake gimlet. (Eagle Lake, Tex.) 18??-???? 16. The Weimar daily informer. (Weimar, Tex.) 18??-???? 17. The Weimar daily gimlet. (Weimar, Tex.) 1887-???? 14. The Colorado County Library and other repositories may have newspapers on microfilm. 15. A complete review of the Colorado County library holdings was performed to see what other sources might be available there. The categories for information in the book, although never filled in completely, are the following: name of deceased, description of deceased, date of inquest, place the inquest was held, date of death if known, place where died or where body was found, nature of information given by JP, by whom information was given, names of suspected person(s), whether person was principal or accomplice, residence of suspected person(s), date of arrest of suspected person(s), in what jail confined, date of bail bond, amount of bail bond, where person on bail bond can be found, names of sureties on bail bond, residence of sureties, and the finding of the justice. Frank Little was the only person of that surname to be buried in the Oakes Cemetery. It is not known whether any of these persons with the surname Little are related to Frank E. Little. The following searches were run: "f.e. Little" "frank e. Little" "frank Little" "john oakes" "john c. oakes" "j.c. oakes"
Most of the references were back to the cemetery and the obituary for John C. Oakes. There was one article which showed John C. Oakes as a confederate veteran. 16. A complete review of the Colorado County courthouse holdings should be performed to see what other sources might be available there. This would require a courthouse site visit to Columbus, Texas and would have to be completed in a future phase of research. 17. The Galveston Daily News often included news from around the state. 18. Newspapers.com and GenealogyBank.com may have news of the death of Frank Little in Texas. Search of “Frank E. Little revealed no articles in Texas in Newspapers.com. There was a clipping of the wedding of Frank E. Little and Elizabeth Nightingale in Oregon but that was something that Kathy Baxter already found. Genealogy Bank had a total of 578 matches in their newspaper collection. Narrowing the date range to the 1907-1925 period resulted in 77 matches. This match would require further searching on Frank E. Little of Colorado Springs to confirm the identity. The rest of the articles were matches on “Frank E.” only. A search was run at Ancestry.com for Frank E. Little in Colorado. The gentleman from Colorado Springs was located and it seemed intriguing at first because he was born in Illinois. However, he was born about 1882 and our research subject was born in 1855. He was residing in Colorado Springs as early as 1904 and working as a clerk. He lived at least until after the 1940 census. 19. The Portal to Texas History should be reviewed for news of Frank E. Little in Texas newspapers. The URL for the Portal to Texas History is https://texashistory.unt.edu. 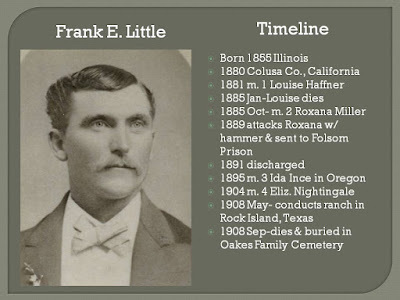 · There were eight results for a search of “Frank Little.” All of them seemed to relate to cattle transactions of Mr. Frank Little of Ramona, Oklahoma in the East St. Louis stockyards. The most interesting finds so far are in relation to the persons buried in the Oakes Family Cemetery. Since there are so few graves and they are mostly related to John Calvin Oakes, it would appear that there was a relation between Mr. Oakes and Frank E. Little. The property of J.C. Oakes was located on a modern map from the Colorado County Appraisal District. The name of the property owner was identified. Unfortunately, there were several gaps in the records for the critical year of 1908 including death records and newspapers. Several actions are recommended for future research. Most would require travel to Columbus, the county seat of Colorado County. The budget for the next phase of research needs to be discussed and agreed upon. Handbook of Texas Online, F. B. Largent, Jr., "Rock Island, TX (Colorado County)," accessed September 11, 2016; http://www.tshaonline.org/handbook/online/articles/hlr31. Uploaded on June 15, 2010. Published by the Texas State Historical Association. "Texas, County Tax Rolls, 1837-1910," database with images, FamilySearch (https://familysearch.org/pal:/MM9.3.1/TH-1-13680-62010-88?cc=1827575 : 22 May 2014), Colorado county > 1895 > image 189 of 321; State Archives, Austin. This case study is still ongoing. I am planning a research trip to Colorado County to see what else I can find. My clients are willing to share their information with anyone who is interested in this case. Contact me to get to the most recent research reports including the missing images on the case of Frank E. Little.